water-based example calculations are included. Thus the book can be used for independent study as well as course work. The book focuses on the scarcity of water quantity (rather than water quality). 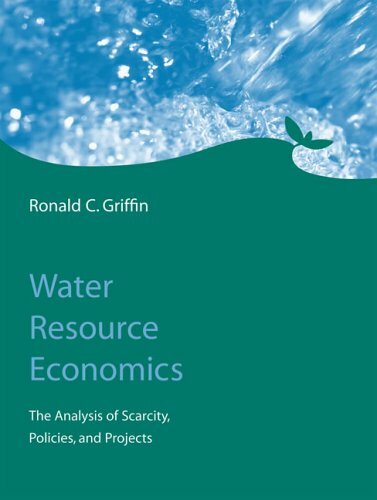 The author presents the economic theory of resource allocation, recognizing the peculiarities imposed by water, and expands the theory to encompass time-defined matters such as ground water depletion. He then discusses such subjects as institutional economics, water law, how economics is used in policy and cost-benefit analysis, the roles of water marketing and water pricing, demand and supply estimation, privatization, and modeling with demand and supply functions. As an aid to readers with specific interests, references to recent literature are given for all of these topics. Each chapter ends with a summary and exercises. All graphic portrayals of economic theory and most calculations are performed using Mathematica software. These programs are downloadable, but their use is entirely optional. Ronald C. Griffin is Professor, Department of Agricultural Economics, Texas A&M University. Is Water Conservation an Additional Goal? What Is the Social Time Value of Money? Is Dynamic Efficiency/Improvement Neutral or Aggregate? How Fast Should Ground Water Be Depleted? The Assignment of Property: Who Should Get It? Can the Downside be Fixed? When Considering Prior Example Studies. . .
What Has Been Gained, Really?